Every year, my literary agent, Erin Murphy, and her crack team of co-agents and office gurus put together a retreat for their clients. The retreat moves around the country from one region to the next, and this year, it was held in Vermont. Sixty-seven talented, funny, crazy children’s book writers and illustrators descended on my unsuspecting state, pretty much doubling our population. And why on earth might this interest you, dear Reader? Well, because among those authors and illustrators are eight musical souls who have banded together, literally, to reveal the inner workings of an author’s brain. (Psst: It’s scary in there.) The band is called Erin Murphy’s Dog, and their motto is “In bocca al coniglio,” a faux-mild children’s-book-worthy appropriation of the galvanizing Italian phrase “in boca al lupo” (literally, “in the mouth of the wolf,” but it means “break a leg!”). 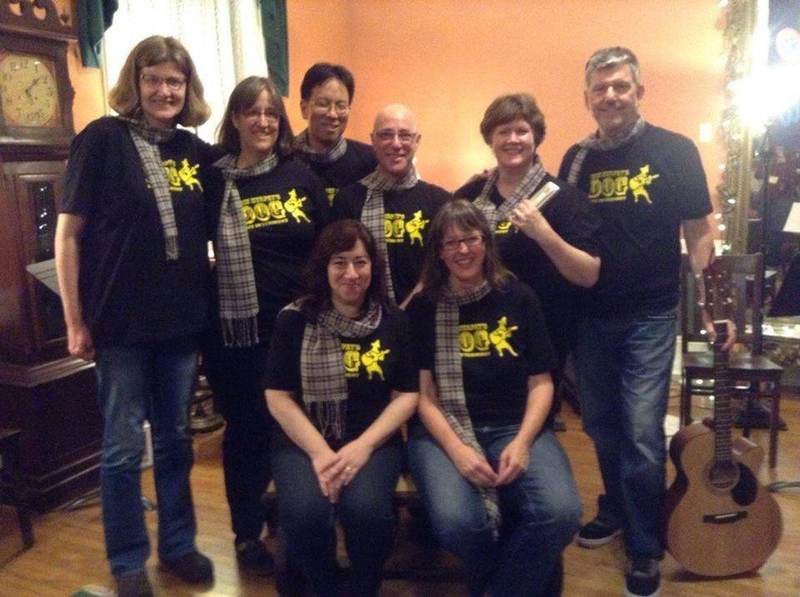 The members of the band are (l. to r. front row) Carrie Gordon Watson, Deborah Underwood, (l. to r. back row) Kristin Nitz, Jeannie Mobley, Mike Jung, Arthur A. Levine (yes, that Arthur A. Levine), Ruth McNally Barshaw, and Conrad Wesselhoeft. Big thanks to Erin Murphy’s Dog for permission to post these videos, with extra gratitude to agency mate, e.E. Charlton-Trujillo, who did the three-camera video recording of these songs and synced the sound and color-corrected on the fly to meet this ShelfTalker deadline! Erin Murphy’s Dog Performs “Editorial Delay” (music by Deborah Underwood, words by Deborah Underwood and Arthur A. Levine) from e.E. Charlton-Trujillo on Vimeo. Erin Murphy’s Dog – YA Cha-Cha Blues (words and music by Conrad Wesselhoeft, in response to a conversation he had with agent and super knitter Erin Murphy about how the writing life can be back and forth … and back and forth) from e.E. Charlton-Trujillo on Vimeo. This entry was posted in Uncategorized on June 3, 2014 by Elizabeth Bluemle. These lyrics deserve a Grammy! Can you post them somewhere so we can read them over and over again? What a fun bunch! And Deborah, you totally rock! So bummed to have missed the retreat this year! Especially since the EMD motto is a spin-off of the Italian “In boca al lupo”–love it! And miss you all. We missed you too Natalie! I can’t believe I get to relive these masterpieces over and over again. 🙂 Bravo to all involved! Go EMD!! I’m so excited to share these with the world! What fun! Surprised all that talent could fit in one room, and impressed to see this “Dog” perform so entertainingly while staying within the bounds of propriety (unlike a certain other dog). it’s so fun to share these with a broader audience. Because who hasn’t run into a little editor/author delay from time to time. Or danced the YA Cha cha blues. Thanks for your fun past, Elizabeth! The image and sound quality is mind-blowing, isn’t it? Eunice is crazy good at this. Omigosh…Crying and laughing, all over again. Ruth, I missed the harmonica! Awesome! I’m grabbing you to hear it next year. Such big thanks to e.E. Charlton-Trujillo for using her mad skills to capturing these fun songs. I smile every time I listen to them. EMD ROCKS! I adore each and every one of you. Eunice, thank you, thank you, thank you for being this year’s video historian. I’m sorry you were under the weather throughout it all. Mike says fling donuts (below) but I’d rather you fling Arches watercolor paper– I’m on a deadline! Elizabeth, thank you for inviting us into your office here at PW. I hope someday you get a window. You know what, I think it’d be simpler for everyone to just throw twenty dollar bills. SO SO SO HAPPY TO SEE IT AGAIN AS OFTEN AS I LIKE!!!! An amazing concert. Now all the world will know of THE DOG. I played “YA Writer” for inspiration before starting work today. Conrad, you are a genius. I listened to it thinking, “Other people are just like me?” Very reassuring. Hey thanks, Susan! We all had tons of fun. Mike and I were both trying to avert our eyes from the dancers lest we melt with laughter. If I’d looked at the dancing for even a second I would have been totally mesmerized, and I’d never have found my way back to the right place in the song! And yes, Conrad is LITERALLY a rock star! What Mike said, below. Flung household staples are welcome, too. Just give us notice before flinging sacks of flour. Double-bagging flour and other dry goods before flinging them is recommended. Also, please fling doughnuts. Lots and lots of doughnuts. A worthy successor to The Rock Bottom Remainders!